What Does Drawdown in Gallons Mean for Pressure Tanks? For the novice dealing with a pumped water system, unfamiliar terms such as drawdown can be confusing. The word actually has a simple meaning, however, and relates to the amount of water a pressure tank holds and how much it can expel without the help of a motor. Generally, drawdown is a term that refers to reduction in water level and the amount of water that is removed from a container to create this reduction. The amount of drawdown can be measured in many different units but for large tanks, it's measured most often in gallons. A pressure tank is an important part of any pumped water system. 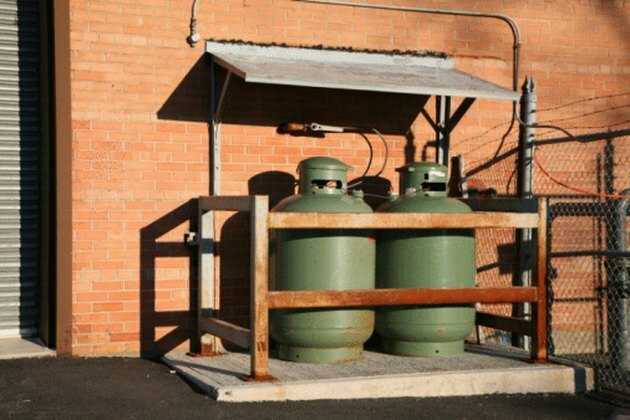 According to "National Driller" magazine's May 2008 article "Using Multiple Pressure Tanks for Larger Systems," the function of a pressure tank is to protect the system's motor from overuse. When water is stored under pressure, it can be released without the motor having to turn on every time a small amount of water is needed. Where pressure tanks are concerned, the word drawdown refers to the amount of water that can be drawn from the tank while the pressure switch is turned off, or without using the motor. Generally pressure tanks are part of a pump-driven water system like a well or an irrigation system, which need to release water periodically. If the volume of water required to refill the well or water dry soil is less than the tank's drawdown, it will be released automatically with the help of the pressure built up inside the tank. On the other hand, the motor will need to turn on in order to release an amount of water greater than the tank's drawdown. One very common setup is a pressure tank with a capacity of 119 gallons working with a 30/50 pressure switch. In its article "Using Multiple Pressure Tanks for Larger Systems," "National Driller" magazine states this yields a drawdown of 36.8 gallons. Andrea Howland-Myers has worked as a writer and editor since 2005. In addition to holding a position as award-winning staff writer at the Oklahoma City University "Campus," she has written, proofread and edited copy for numerous freelance clients. She holds a Bachelor of Music degree from Oklahoma City University.